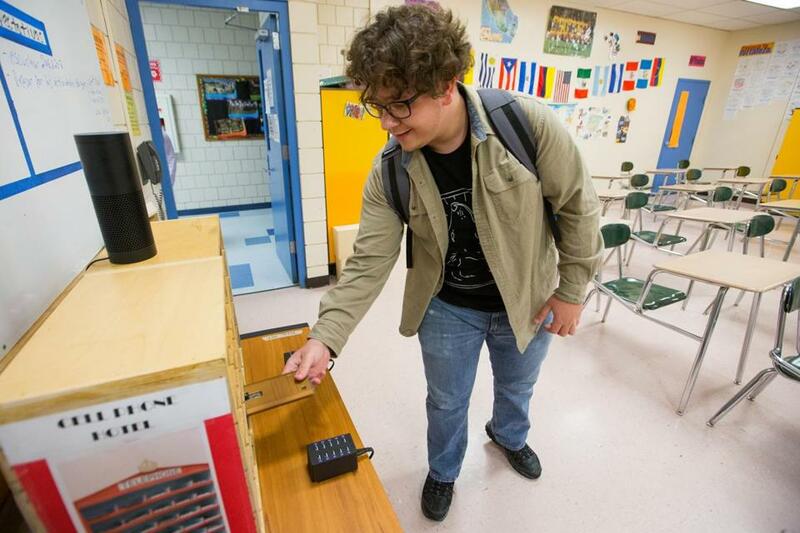 Thiago Zakaitis, a sophomore at Marlborough High School, places his phone in the cellphone hotel before the start of Gerry Padilla&apos;s Spanish class. Some of the challenges that stymie high school teachers about their students have been around for generations. Neglecting homework. Arriving to class late. Dozing off. But for the past 15 years or so, there’s been an even more pernicious obstacle facing teachers: students constantly distracted by their cellphones. Officially, some high schools prohibit the use of cellphones in class and others leave it up to teachers’ discretion, but enforcement is almost impossible. A teacher who spots a student sneaking a look at a text message may not think it’s worth stopping class discussion to call out, and confiscating phones in the classroom means taking on the extra burden of being responsible for other people’s valuables. Spanish teacher Gerald Padilla of Marlborough High School was exasperated. Padilla vented to his wife, Patricia, now the principal of Woodland Academy in Worcester. “She remembered that when she was an elementary teacher, her stepdad, who was a carpenter, built something for her students to store their snacks,” Padilla said. His wife retrieved the item from a storage closet and showed it to him. 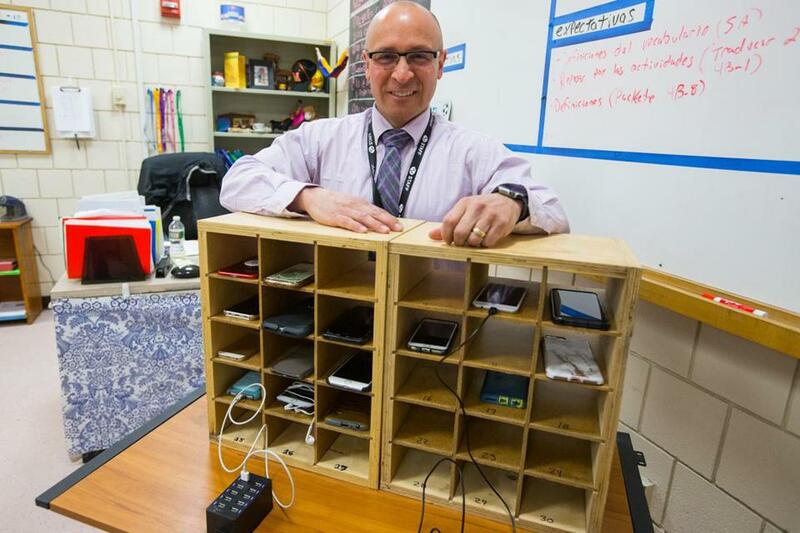 Gerry Padilla, a Spanish teacher at Marlborough High School, showed off the cellphone hotel in his classroom. But the amenities didn’t end there. 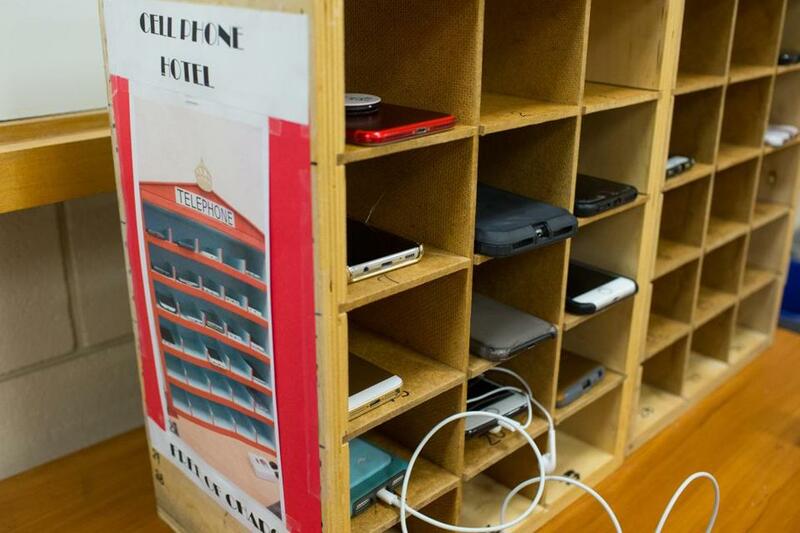 The next day, he told his classes that the electrical company would be providing power for the hotel, and then showed the students how phones could be charged while they were stored in their little wooden chambers. Cell phones filled the phone hotel in Gerry Padilla's Spanish class at Marlborough High School. All that Padilla hoped to accomplish was to get cellphones out of his students’ hands during class time. But a much bigger change than he expected soon transpired. Participation in the cellphone hotel was optional and Padilla knew the novelty might wear off. “It was a fun thing when it first began, but then I had to think about what I could do to get total participation,” he said. This led to a challenge: The class with the best participation rate would win a pizza party. In the end, he had to throw two pizza parties when two classes tied with “about 99 percent participation,” he recalled. Brian Oram, a senior in Padilla’s class, recalled being “a little shocked and resentful” when the idea was introduced. “Teenagers, myself included, can be very attached to their phones, so not being able to have it in class was a little uncomfortable at first,” Oram said. In fact, Oram opted out initially. But with the promise of a pizza party for the class that logged the most participation, he gave it a try — and was pleased with the results. For senior Brittany Jakubiak, the chance to charge her phone in the middle of the school day was the icing on the cake, but she too acknowledges the positive effect that enforced separation from her phone has had on her. “My grades have jumped up. For me it is not about the possibility of a reward, but rather a tool I can use to help improve my grade and keep me focused,” she said. As for students — or their parents — who worry about not being able to be in touch at critical times, Padilla has already trained his classes to grab their phones from the cellphone hotel (if circumstances allow) as part of an emergency drill.